The lowly $20 – $35 RTL-2832U dongle is being used for several interesting projects these days. That is to be expected for a VHF/UHF SDR radio that is available at this price range. Considering that the RTL2832U / E4000 DVB-T sticks didn’t start life as a SDR radio, they have done a pretty good job of impersonating one. I am still pretty impressed just how well they work. Remember it is important that it to get a good RTL2832U DVB-T stick to make these projects work well. I have had very good luck with the Ezcap 668 DVB-T stick. I would say that it performs easily as well as the 4 times more expensive Funcube Dongle if not better. When buying any RTL-2832 DVB-T stick make sure it also contains the Elonics 4000 chip. Some DVB-T sticks may not include the E4000 chip (even some of the Ezcap sticks marked 668 may not contain the E4000), buy from a vendor that knows what they are selling and with a good return policy. Maybe eventually a cheap certified for SDR use RTL2832U stick will come out, until then your mileage may vary on the quality of these sticks. With that being said, lets move on to using the RTL-2832U with Unitrunker. This project as popped up lately on the internet and involves using a modified version of SDR Sharp that can communicate with UniTrunker. If you are not familiar with UniTrunker, it is basically a program that can decode information included in the control channel stream transmitted from a trunked radio system. Using UniTrunker, you can document the system as well as see what is going on behind the scenes so to speak. For more information go to the UniTrunker web site or the Radio Reference Wiki. With the availability of commercial trunk tracking radios, why would you want to do this? Well, it’s interesting, educational, and there maybe a bonus of tracking and decoding unencrypted APCO-25 radio systems which is only available on more expensive digital scanners. One of the problems with using UniTrunker for some radio hobbyist in the past is the inherit cost of running a UniTrunker system. Just to be able to decode the control channel alone typically requires a scanner or 800MHz radio with a discriminator output which are not to common. However, some radios can be modified to provide a discriminator output by modifying it. This requires opening your radio and soldering some wires in the correct place. Some scanners can output control data directly through a usb interface directly to UniTrunker (see the Radio Reference Wiki for a list of these radios). This radio is referred to as the “Signal Radio”. This all you need if you want to just see what type of data the control channel is outputting. If you want to listen to the transmissions a second computer controlled radio is needed called the “Control Radio”. UnitTrunker will automatically tune the Control radio to the correct frequency to allow you to hear the transmission. As you see, this can add up unless you already have the appropriate equipment. 1. If you already own a radio with a discriminator tap (Signal Radio), the RTL-2832U can be used as the “Control Radio” since the modified SDR Sharp program can communicate with UniTrunker to automatically tune the dongle to the correct frequency. 3. If you neither types of radio, good news. Two RTL-2832U dongle are supposed to work. One as the “Signal Radio” and one as the “Control Radio”. This would give you a very inexpensive and very portable UniTrunker system for less than $75. However, I didn’t get a chance to check this out since one of my other RT2832U / E4000 dongles won’t receive 800MHz. However, it looks like it should work. I tested using the RTL-2832U as the Signal radio to drive UniTrunker and using a GRE 410 as the computer controlled Control radio. This was a pretty simple setup and worked great. All you have to do is manually tune the RTL-2832U dongle to the control channel for the trunking system using SDR Sharp and setup UniTrunker for both radios. UniTrunker will show the control channel data while tuning the second radio to the frequency providing the audio for the incoming call. 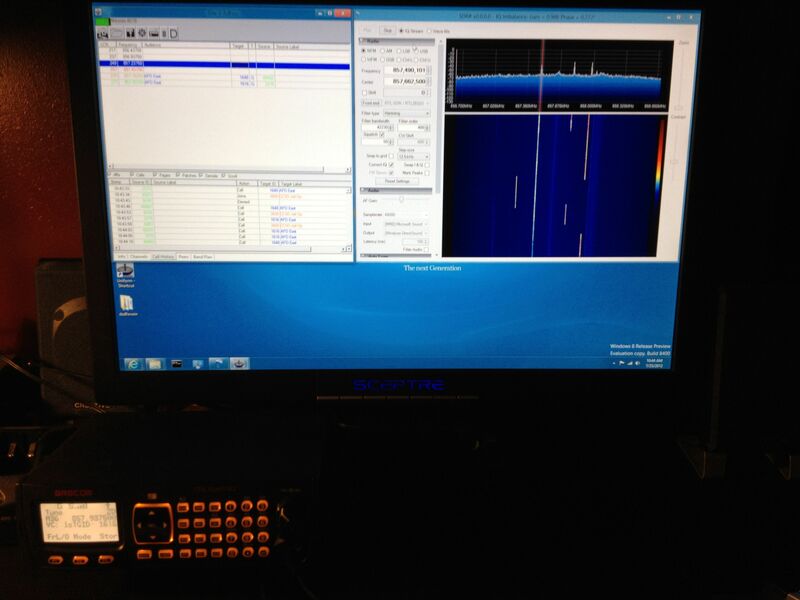 I also tested the modified version of SDR Sharp using the RTL-2832U as the Control Radio. The signal radio was the DJ-X11 with its built in discriminator output. I know I have easily used the GRE-410 as the Signal radio, since it will output control channel data directly using the optional data, but I was just curious of how well the DJ-X11 discriminator worked. 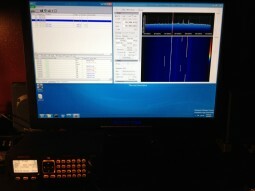 The DJ-X11 worked great and so did the modified version of SDR Sharp. It was interesting watching SDR Sharp jumping around to receive the audio channels. This is a little more complicated to setup, since it requires interfacing the modified version of SDR Sharp trunk tracking features with UniTrunking and some extra audio routing. I wasn’t able to test this, but there also may be a possibility of using UniTrunker to track a APCO-25 systems and using a program called DSD that can decode several digital audio formats. To get started with this project you will need to download the modified version of SDR Sharp, Virtual Audio Cable, and DSD if digital audio decoding is required. Virtual Audio Cable is not a free piece of software, but you can download a demo version to test out this project. You will get an interruption in the audio announcing you are using the trial version. VAC allows you to reroute your computer audio input and output through different programs and is well worth the purchase if you are doing a lot of SDR radio experimentation. Ok, ready to get started! Someone has written an excellent post on how to get this all going. Rather than repeat that here, I am just going to point you there. It is very important to follow the instructions closely to get this work. Once you have all the concepts down on how to get UniTrunker, SDR Sharp, and the RTL2832U sticks all talking to one another, you can vary the mix of radios to customize the system as you need to. Good Luck! Disclaimer – The following documentation was not prepared by Ham Radio Science. Also, the version of SDR Sharp used in the following documentation is from an unknown source and probably not approved by the author of SDR Sharp, so use at your own risk. Here is the link to the documentation on setting this up. Note: The documentation assumes that you have already set up your RTL-2832U dongle to work with SDR Sharp. Let us know how this works for you in our RTL-2832U forum!